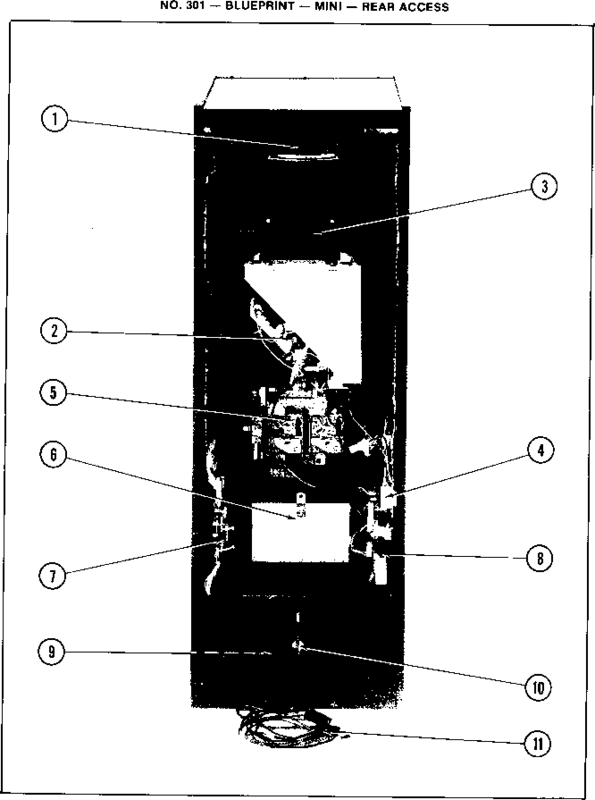 The following section describes the electronic assemblies within the Lunar Lander game. Some of these new designs are, X-Y monitor, Regulator/Audio PCB, X-Y game PCB, and Power Supply. For information concerning the X-Y monitor, please refer to the monitor manual that is included with the game. Figure 11 of this manual shows the distribution of signals of the gapne. The Regulator/Audio PCB is the smaller PCB, located on the left wall (standing in front of the game) of the cabinet. It was designed for two reasons: 1) to remove high-heat-producing components from the game PCB, and 2) to provide better regulation of the + 5 VDC logic power for the game PCB. A description of both the regulator and audio sections of the PCB is included on Sheet 1, Side A, of the large sheets included with this manual. The schematic for the audio section is repeated on Side B of the sheet. The control panel on the front of the game includes the Lunar Lander Mission Select PCB, Thrust Control, and four LED pushbutton switches. The Mission Select PCB contains five #1816 lamps. Lamp 1, the INSTRUCTIONS lamp, is always on, as it is connected between +10.3 VDC and two diodes to ground.- The other four lamps are lighted by signals LAMP2 thru LAMP5 from the output of the game PCB. These lamps are connected between +10.3 VDC and the collector of a transistor for each lamp. When the base of a transistor is low, the associated lamp is off. When the base voltage goes high, the lamp lights. The Thrust Control contains a 5K ohm potentiometer that is connected between + 5 VDC and ground. The wiper of the potentiometer is connected to the POTIN input of the game PCB. There is no calibration necessary for this control. The four pushbuttons on the control panel each have light-emitting diodes (LEDs) inside their buttons. The ROTATE LEFT and ROTATE RIGHT switches are always lighted. The SELECT and START switches are lighted by the START/SELECT output signal from the game PCB. When this signal is high, the LEDs in both the SELECT and START switches are unlighted. When this signal is low, both switches are lighted. The game PCB is the larger PCB located on the left wall of the cabinet. This PCB contains power input regulators, a microcomputer, audio generator circuit, vector generator (actually a second microcomputer), and video output circuit. The power input circuitry to the game PCB is described on Sheet 1, Side B, of the large sheets included with this frianual. Also included on this side of Sheet 1 is the schematic and functional descriptions of the game PCB's mission select output, audio output, and video output. A memory map is included in the address decoding circuit block of the microcomputer schematic. The memory map identifies the addresses that the MPU uses to gain access to its peripheral circuits. The ones and zeroes in the ADDRESS column indicate the address necessary for information to be passed to and from the MPU. A zero indicates that the address line is low, and a 1 indicates the line is high. Blank spaces indicate that it doesn't matter whether the address line is low or high. An A indicates that the address line is used as part of the functional address for that particular peripheral access. In the DATA column, a D indicates that the data line is used to transfer information. The inputs and outputs of the vector generator circuitry are defined on Sheet 2, Side B, of the schematic package with this manual. This circuit is in itself a semi-smart microcomputer. It receives instructions from the "game" microcomputer and once instructed what it is to do, it executes the instruction. When it is finished, it tells the microcomputer, via the HALT signal from the SINP1 switch input port, that it is through and is waiting for its next instruction. All of the picture data on the monitor screen is stored in the program memory of the vector generator. The vector generator RAM receives information from the game microcomputer that tells it what video should be displayed, i.e., rotation of the lunar lander, amount of lunar lander thrust, messages to be displayed on the monitor, etc. The vector generator then accesses this appropriate video stored in its ROM memory and outputs it to the X-Y monitor display.